SEE PHOTOS AND A REVIEW OF GMM'S 1/350 WW2 USN CARRIER DECAL SET! 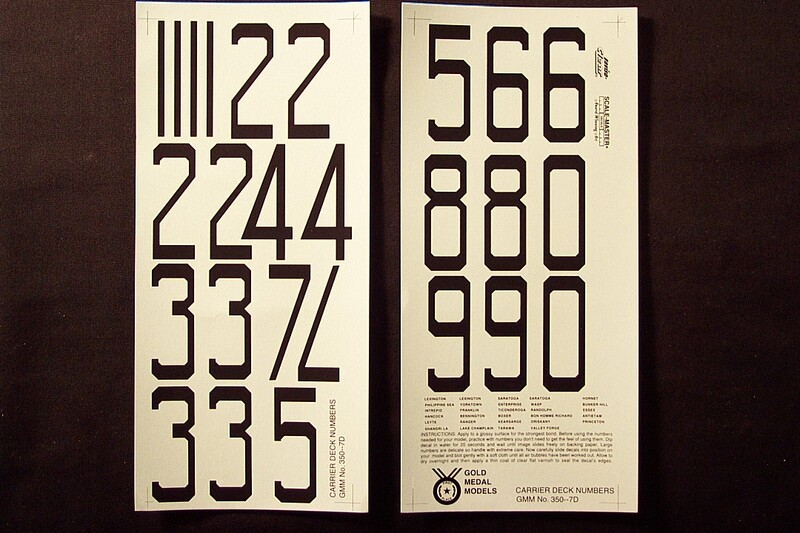 Two 9" by 4" sheets that contain large black numerals for the flight decks of World War Two U.S. Navy Fleet Aircraft Carriers, particularly Yorktown and Essex-class ships. The decal provides numbers in the following quantities: 1 x 4; 2 x 4; 3 x 4, and 4 through 0 x 2 each. Also supplied are the following ships' names in black: Lexington (two names provided), Saratoga (two names provided), and one sample each of Wasp, Yorktown, Enterprise, Hornet, Essex, Intrepid, Franklin, Ticonderoga, Randolph, Bunker Hill, Hancock, Bennington, Boxer, Bon Homme Richard, Leyte, Kearsarge, Antietam, Princeton, Shangri La, Lake Champlain, Tarawa, Valley Forge, and Philippine Sea. All decals are printed in flat black with the deck numerals having flat clear carrier film over the color image areas only. All numbers have correct configurations and sizes based on study of aerial photos of actual WW2 USN carriers. WARNING! The large flight deck numbers have been designed to eliminate the clear carrier film effect from the hollow areas of the numbers and this makes the decal numerals EXTREMELY delicate after they have been dipped in water. To avoid problems, allow the image to thoroughly loosen from the paper backing sheet and slide the image VERY GENTLY using small movements onto the plastic model's surface. Make certain the model's surface is thoroughly wetted before attempting to slide the decal onto it or tearing and fracturing may result. MODELER'S TIP: Use a number that won't be needed on your model to practice your techniques before committing yourself to the actual numbers you need.